Just as the name suggests a bridge literally bridges the gap left when there is one or more missing teeth by using three or more crowns, adjacent to a replacement tooth. The crowns are used as an anchor, which support the replacement tooth and are an effective solution for restoring the function of a tooth. Unlike dental implants, a bridge is not a permanent fixture, however it can last a long time if cared for well. For this reason, a bridge may be a more cost-effective solution for replacing a missing tooth. What is a bridge made from? 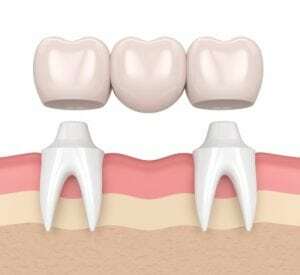 Just like a crown, a bridge is made from either a porcelain or ceramic material that is durable and custom made to look just like your existing teeth. Is a dental bridge permanent? Just like a dental crown a bridge is not a permanent fitting, however, it can be very long-lasting if it is well maintained. There are factors that may affect the lifespan of your prosthesis, which can be discussed with your dentist during your consultation. A dental bridge cannot be removed by anyone other than a dental professional, as it is securely bound to your existing teeth. There is generally no need to have a bridge removed, as it has been custom designed for your mouth and should fit comfortably. Whilst it isn’t a permanent fitting, a bridge is still bound very securely to your existing teeth and can only be removed by dentist or dental professional. There is no reason for a bridge to be removed unless it becomes damaged through regular use or poor maintenance. The team at Surf Coast Dental offer dental bridges as a safe and effective tooth replacement option for patients with missing or ‘terminally damaged’ teeth. In order to ensure that you don’t suffer from bone resorption or a sunken facial appearance due to missing teeth, a dental bridge can be fitted right here in our Torquay practice. If you have any questions or would like to book a dental bridge consultation, contact our friendly team today!